Merriam Press World War 2 Album WA6 (First Edition, 2015). 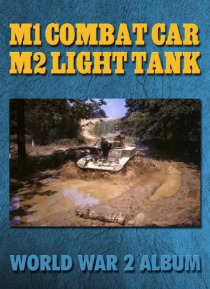 A pictorial history of the M1 Combat Car and the M2 Light Tank. The M1 Combat Car was a light tank used by the U.S. Cavalry in the late 1930s. After the Spanish Civil War, most armies, including the U.S. Army, realized that they needed "e;gun"e; armed tanks and not vehicles armed merely with machine guns, and so the M1 became obsol… ete. The M1 was the immediate predecessor of the M2 Light Tank. The Light Tank M2 was an American pre-World War II light tank that saw combat with the U.S. Marine Corps' 1st Tank Battalion on Guadalcanal in 1942. M2A4s served in Burma and India with the British 7th Hussars and 2nd Royal Tank Regiment. The M2A4 was the immediate predecessor of the M3 Stuart series of light tanks. 222 photos, 3 drawings, 1 cutaway drawing, 1 sectional side view drawing, 1 four-view drawing.